Fourth Standard Student's Doodle will feature Tomorrow (November 14) on Google India home page. Google has selected this Doodle by arranging Doodle competition for the Indian school students studying from Class 1 to Class 10th. The contest was judged by a panel of judges that comprised renowned cartoonist N. Ponnappa, artist Raghava K.K. and the faculty of the National Institute of Design, Ahmedabad. The Winning Doodle was drawn by Puru Pratap Singh, a 4th standard student living at Gurgaon. 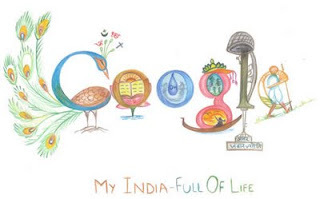 Theme of his Doodle is "My India- full of life". He has explained his Theme as below. Find below his Doodle. Let’s open up the Google home page on Tomorrow(November 14) with this doodle. Besides having his doodle featured on the Google India homepage all day on Children's Day, Puru Pratap Singh has also been awarded a laptop computer and a t-shirt with his doodle. And, Google provides Rs.100,000 technology grant for his school. 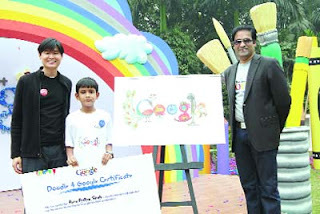 Google India MD Shailesh Rao said, "This was first ever Doodle competition in India. This is the first 'made in India' Doodle." Dennis Hwang, the Master Doodler says "India is a land of creative minds. For centuries, Indian art has continued to fascinate people from across the globe. It was amazing to see how young kids could come out with highly creative Doodles that truly define the culture and tradition of this incredible country. Choosing the successful entry was not easy as every Doodle depicts India in a unique manner."